Low stream flows have forced officials to suspend water usage for the natural gas development (fracking) in portions of Pennsylvania. According to officials, the restrictions are applied to various streams when flow rates reach a certain threshold and do not wait for declaration of a drought. 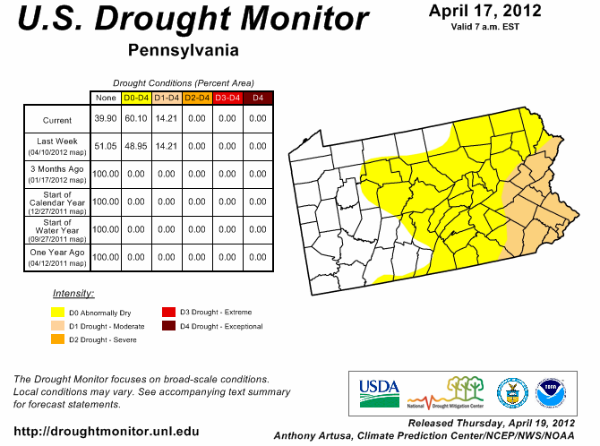 A lack of snowfall this winter and a lack of rain this spring were the major players in abnormally low stream flows, low ground water levels and depleted soil moisture. The abnormally dry conditions have also resulted in an elevated and extended wildfire season this year. According to a report published by the Susquehanna River Basin Commission (SBRC), 17 separate water withdrawals were temporarily suspended. The suspension, initiated to mitigate plunging stream flows in the basin affects 10 companies in five Pennsylvania counties. Those counties are Bradford, Luzerne, Lycoming, Susquehanna and Tioga. Additional withdrawals may be suspended if rainfall continues to trend below normal. Not all SRBC approvals contain passby restrictions. Those are the withdrawals where the approved withdrawal amounts are so small that they will not affect the protective levels of streams. In those cases, companies can continue to take water during low flow periods. According to the U.S. Energy Information Administration, Pennsylvania ranks 15th in the nation among natural gas producing states. In Pennsylvania, gas wells cannot be drilled within 200 feet of structures, water wells or freshwater springs or within 100 feet of streams or wetlands. Waivers allow companies to drill inside of these limits with additional protective measures. Residential water wells reach an average depth of about 200 feet, but occasionally can reach depths of more than 500 feet. About 34% of U.S. public water supply comes from groundwater sources, while the rest comes from surface water bodies like lakes, rivers, and reservoirs. Municipal wells work like residential wells, but typically have a larger diameter and higher flow rate. The Pennsylvania Department of Environmental Protection (DEP), in cooperation with the Delaware River Basin Commission and the Susquehanna River Basin Commission, regulates water used for Marcellus Shale drilling in Pennsylvania. As part of the permit application process, drilling companies must identify the water sources from which they plan to obtain water and specify anticipated impacts. Sources may include rivers, streams, and lakes or municipalities and must be approved by the appropriate river basin commission. Each gas well requires an average of 400 tanker trucks to carry water and supplies to and from the site. It takes 1-8 million gallons of water to complete each fracturing job. The water brought in is mixed with sand and chemicals to create fracking fluid. Approximately 40,000 gallons of chemicals are used per fracturing. Up to 600 chemicals are used in fracking fluid, including known carcinogens and toxins such as…LEAD, URANIUM, MERCURY, ETHYLENE GLYCOL, RADIUM, METHANOL, HYDROCHLORIC ACID, FORMALDEHYDE, etc. The fracking fluid is then pressure injected into the ground through a drilled pipeline. The mixture reaches the end of the well where the high pressure causes the nearby shale rock to crack, creating fissures where natural gas flows into the well. During this process, methane gas and toxic chemicals leach out from the system and contaminate nearby groundwater. Methane concentrations are 17x higher in drinking-water wells near fracturing sites than in normal wells. There have been over 1,000 documented cases of water contamination next to areas of gas drilling as well as cases of sensory, respiratory, and neurological damage due to ingested contaminated water. Only 30-50% of the fracturing fluid is recovered, the rest of the toxic fluid is left in the ground and is not biodegradable. The waste fluid is left in open air pits to evaporate, releasing harmful VOC’s (volatile organic compounds) into the atmosphere, creating contaminated air, acid rain, and ground level ozone. "Unpacking Health Hazards in Fracking's Chemical Cocktail"
More than 72 percent of the Susquehanna River Basin is underlain by the Marcellus Shale, a sedimentary rock formation that holds one of the richest deposits of natural gas in the lower 48 states. This black shale and other gas-bearing shales like the Utica Shale run deep underground — much of these rocks are more than a mile beneath the surface. Extracting gas from these shales is technically and economically feasible using a process known as “hydraulic fracturing,’’ which creates millions of artificial fractures that allow the collection of trapped gas. The process requires large volumes of water to be mixed with sand and chemicals that are pumped into the shale under high pressure to shatter the formation facilitating release of the gas. SRBC considers all fresh water used in hydraulic fracturing to be consumptively lost to the system. 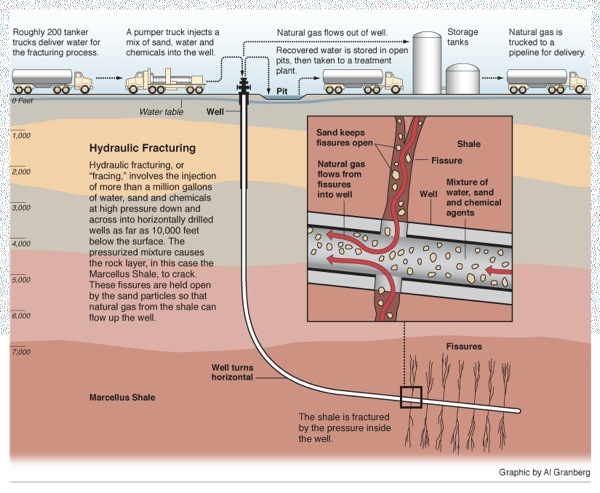 A typical Marcellus Shale hydraulic fracturing stimulation uses 4-7 million gallons of water over a 2- to 5-day period. About 15 percent of the water flows back to the surface within 2 to 8 weeks.Fluid used in hydraulic fracturing is typically comprised of more than 98 percent water and sand with chemical additives comprising less than 2 percent or less of the fluid. 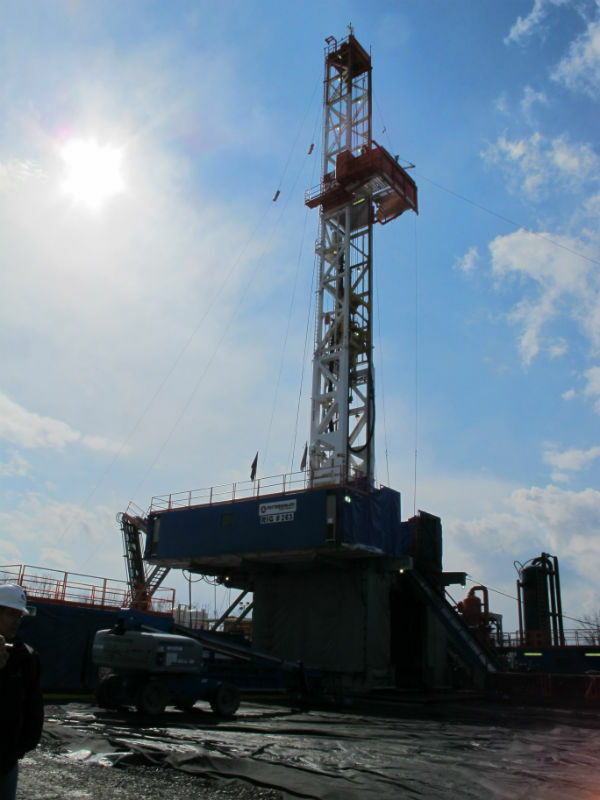 Since October 2008, companies drilling in Pennsylvania are required to disclose additives used in hydraulic fracturing as part of the state permit process. Generally, the maximum depth of potable water is 850 feet below the ground surface. Shale gas formations are vertically separated from freshwater aquifers by at least 1,000 feet of sandstones and shales of moderate to low permeability.